The properties around Mission come in all shapes and sizes. 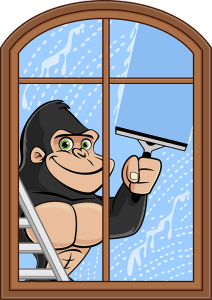 When you need a hand cleaning off those hard to reach windows, call our Gorillas. Our Mission window cleaning service is available to give your space a sparkle and shine. Cleaning off interior windows is a regular chore in most households but outdoors is another story. 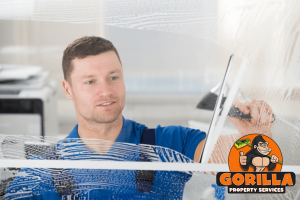 Our Gorilla technicians have all the right tools to get your windows cleaned safely, efficiently and with the best results. If you are wondering what the difference is between an ordinary cleaning and the Gorilla method: let us tell you! Wiping motions cause a static charge that attracts dirt and dust to the surface of your window. Even when you think you are wiping them clean, your windows are getting dirty all over again. That is why our Gorillas use rubber squeegees against glass, removing the threat of static cling. In addition to eliminating static cling, our cleaning solutions are eco-friendly. Ditch the harsh aftermath of average, department store chemicals. Our Gorillas use products designed to eliminate threats to your property and to your health. Our Gorillas don’t like to sneak around. In fact, you will never have a hard time finding us. All of our technicians are uniformed in bright colours – even our Gorilla-Mobiles are dressed up. These specialty vehicles do more than look good. Each Gorilla-Mobile is equipped with any and all tools that we might need for the job. When it comes to Mission window cleaning, technicians use water-fed poles to reach exterior windows up to four storeys. Gorillas might be known for swinging, but with these poles, we can get your windows sparkling with our feet on the ground.